Innovation and technology have revolutionised the way we think about social good, as evidenced by the growth of social entrepreneurship, the sharing economy and the values revolution. Moreover, the old concept of pay it forward reminds us of the power of the collective - through small and thoughtful actions for greater impact. 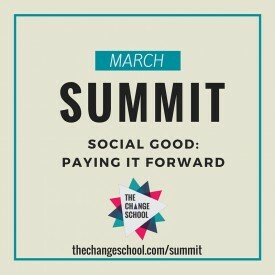 How can Global Citizens harness their experiences and resources to drive social change and champion social good? 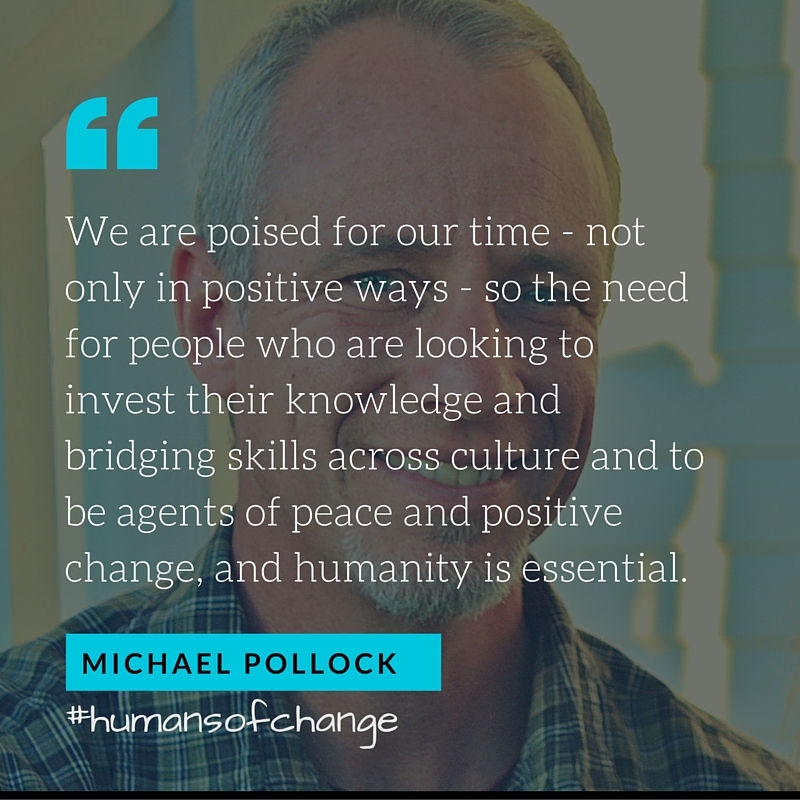 This month's Summit talks feature five Humans of Change of different ages, backgrounds and professional spheres, sharing the vision, inspiration and motivation that drives them to wake up each day and make the world better in simple and great ways. Be sure to subscribe to our YouTube channel to follow our monthly themes and weekly talks on all things related to Global Citizenry. Stories are the most powerful - what happens when a person spends time in a culture outside their own, comes back home, and realises it's not their home anymore?What happens to their potential? What happens when people get lost? How can one develop their abilities, gifts, formative experiences, proficiencies and skills, personality, passion, burdens and sense of calling to move towards a purposeful contribution in society? Identifying common/unique assets is taking into consideration our language and cross-cultural intelligence and skills, our ability to empathise and reserve judgement, our capacity for observation and critical analysis, and to transition and adapt to different situations. Finding mentors - First, a peer in the culture (an introducer who can connect you to the culture, help avoid pitfalls, and adjust), second, a peer who is cross-cultural (someone who understands your own experience - a listener and empathiser to help you through a place of transition to contribution), third, an older adviser (the navigation person who can see beyond the years and perspective that you have - can be in your area of vocation/work or life). Take risks - We need to weigh them with our possible loss and potential gain, to make sure that if we’re gonna jump in, we’re not going to put ourselves at severe risk; without risk/challenge, there is no growth. Sense of humility - Having the right assessment of self that doesn’t put us down but takes a healthy measure that isn’t too high above others; willing to be a learner and eliminating the “I should already know this” mentality - to know what you don’t know. 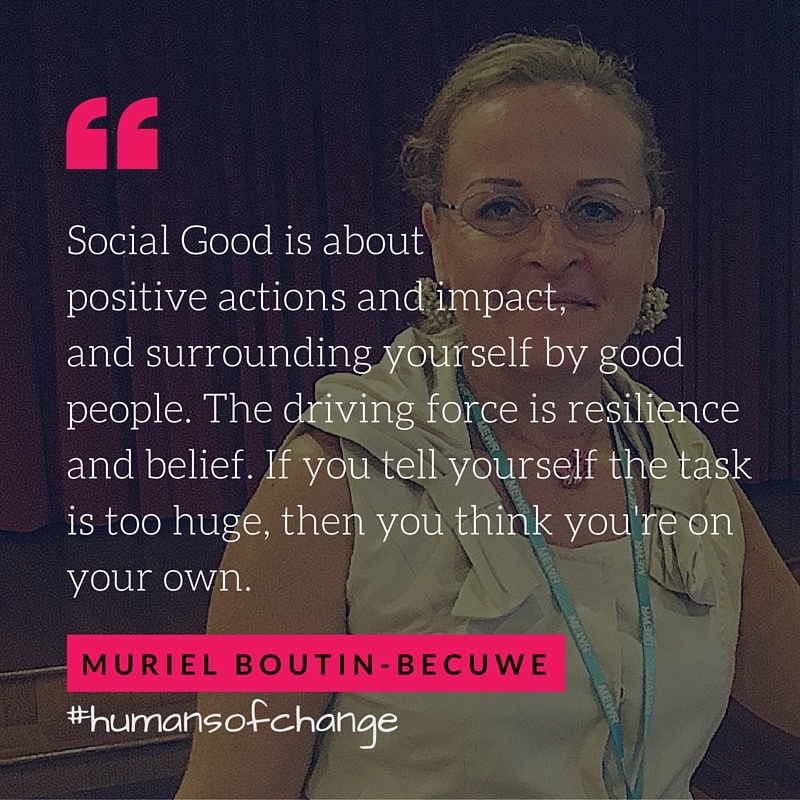 When we go through this process of balancing challenges and assets, taking stock, reflection with mentors, and wrapping it all in humilitiy, we can realise and recognise our potential and maximise our impact of social good. Sixteen years ago I made the difficult decision to leave the MNC I'd been working for and jump into the world of entrepreneurship. I had a lingering dream to make a difference in my life and others' and I sought out other Global Citizens who wanted to make an impact with me. Together we raised seed funding and government grants to help hotels recycle their wastage through charities, NGOs, social enterprises and government based programs. Our notion of paying it forward was to help hotels make an impact environmentally and socially, whilst doing good at the same time. So many people don’t have the chance or privilege to live in a melting pot. You realise there is a lot of ignorance and bias and fear surrounding our differences of colour, religion, traits and features. The bottom line is that we must celebrate cultures and diversity of ideas with no boundaries - your roots are wherever you are during your life journey. Being a TCK isn’t the same as being a Global Citizen - how is anyone stepping outside of their culture when living inside of the expat bubble? Transformation is far more simple than you might think, but it's a completely different mindset. We all have the capacity for ethnocultural empathy, but most adults don’t. Most people can only feel empathetic toward people who resemble them (either culturally or linguistically) or whom they identify with socioeconomically. Our vision is to build and allow kids the opportunity to develop, not just a tolerance or appreciation for other cultures, but immersive, engaging and exciting shared experiences where they collaborate and co-create with new friends around the world on social enterprise projects. In 2030, we’ll have kids who care deeply about progress towards these goals and potentially have a bunch of globally minded 23 year olds who know how to work with people from different cultures and the skills needed to work on virtual teams. I’ve been fortunate enough to find a tribe of educators who are deeply passionate about empowering youth and developing a love for the whole world - we are born with a desire to help people. This love for the whole world and desire to connect with humanity across borders is innate and instinctive, the only thing needed are opportunities. 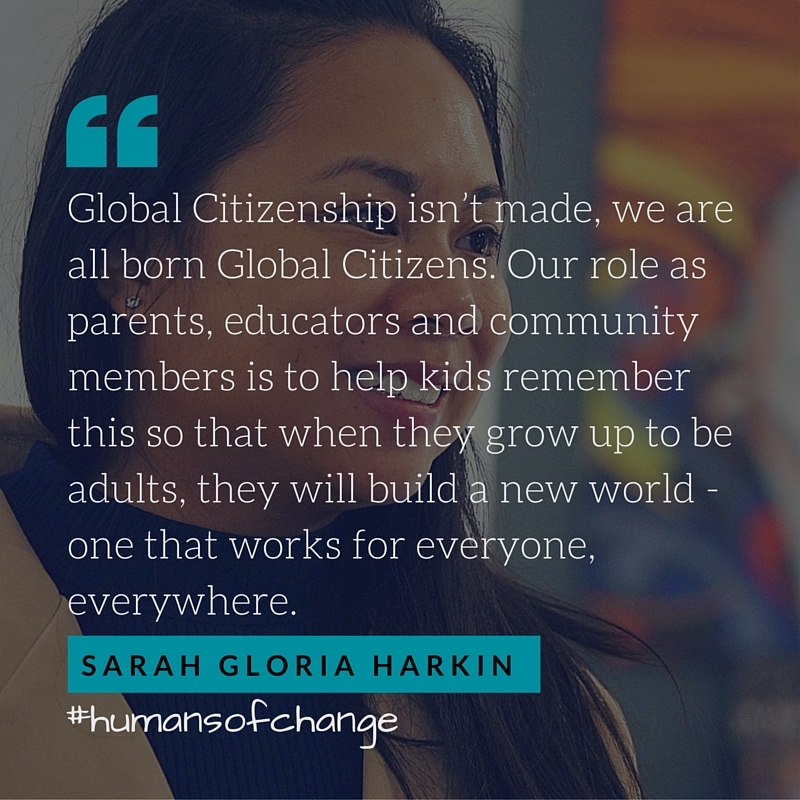 Global Citizenship isn’t made, we are all born Global Citizens. Our roles as parents, educators and community members is to help kids remember this so that when they grow up as adults, they will build a new world - one that works for everyone, everywhere. A world where we do not see people as needing to be saved, or overvaluing people from places of power, but a world where we value individuals based on their capacity to uplift and empower others. Instead of isolating or pressuring others to assimilate, these kids will ban together and grow a world that is rich in diversity, that celebrates our kaleidescope of cultures, and protects all of our human achievements and traditions for generations to come. This world is possible. 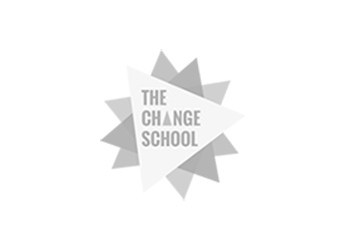 Global Citizenship isn’t taught at university or special schools. Every child, every day, born in this world has the natural desire to reach out and love everyone in the whole world - let’s protect this and cherish this instinct that calls us to empathise with everyone everywhere. As an economist, a theory put forth by Michael Porter and Mark Kramen on Shared Value (Harvard Business Review) has had a profound effect on me: "It is not only possible, but in fact essential, that businesses should make great profits while at the same time solve social problems”. Growing up in the UK, I had a privileged upbringing and was a TCK growing up between the cultures of business and not-for-profit. I realised that a business brain and a social conscious mattered, but increasingly in the world I’d been observing a disconnect - a widening gap between having and giving. On the one hand, as consumers we’re buying more and more stuff from big companies with less and less understanding of the social impact our spending decisions are having in the world. On the other hand, we’re giving more and more to charities and non-profits who are desperately trying to solve the very same problems that our spending is creating. It’s insane! I believe this makes us all Global Citizens. It doesn’t matter where we were raised, or where we were born, where we live, or where we work; when we spend money, it changes the world - for better or for worse. 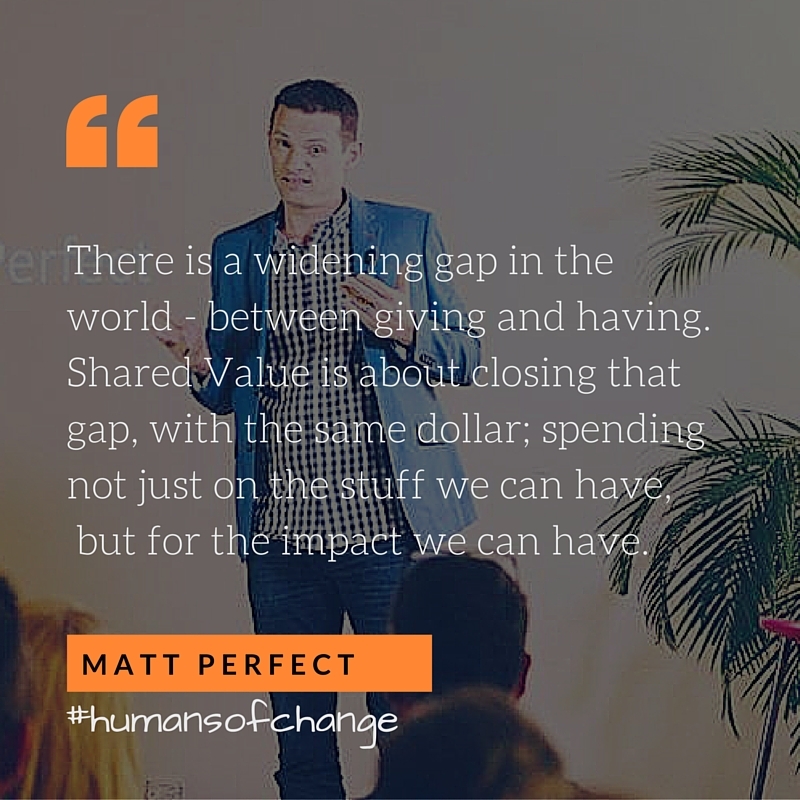 Shared value is about closing that gap - having and giving, with the same dollar. Spending not just for the stuff we can have, but for the impact we can have. That’s a story I’m excited to tell my kids. When they grow up they won’t need economists to make sense of their lives, because this is the world we Global Citizens can create for them. I was born in India, grew up in Singapore, went to highschool in London, and earned my Bachelor's degree in New York where I've been working for six years. I'm now back in India, my homeland, after 23 years. I can barely speak the language, though I'm getting better, and there is tradition and culture here that I've only experienced a glipse of in my upbringing. I've been fortunate to have had a year of no obligations, total freedom, and trying to find myself (still trying to!) and this has helped me to finally my experience of not really having a country to belong to. I always saw this as a negative, a chip on my shoulder, but I now see it as an opportunity to somethign much greater - to thrive and to stop having self doubt, and to grow into the person I see and am becoming. It's no longer about drifting through life and different cities, but setting up a foundation to build somethign for myself instead of just working for the next paycheck. I think of myself as a Global Citizen because I feel at home anywhere - every place I've been to has allowed me to build myself with great family and support. I'm still just 26 years old, but living in our hyper-connected world, I see that I have so much ahead of me. I've seen people overcome such tremendous adversity, and my life pales in comparison. So now I'm figuring out how to put all the puzzle pieces of my life together - they weren't arranged properly! I'm finally emerging from the shell that I'd become in New York and embracing my talents and capabilities to do so much more. 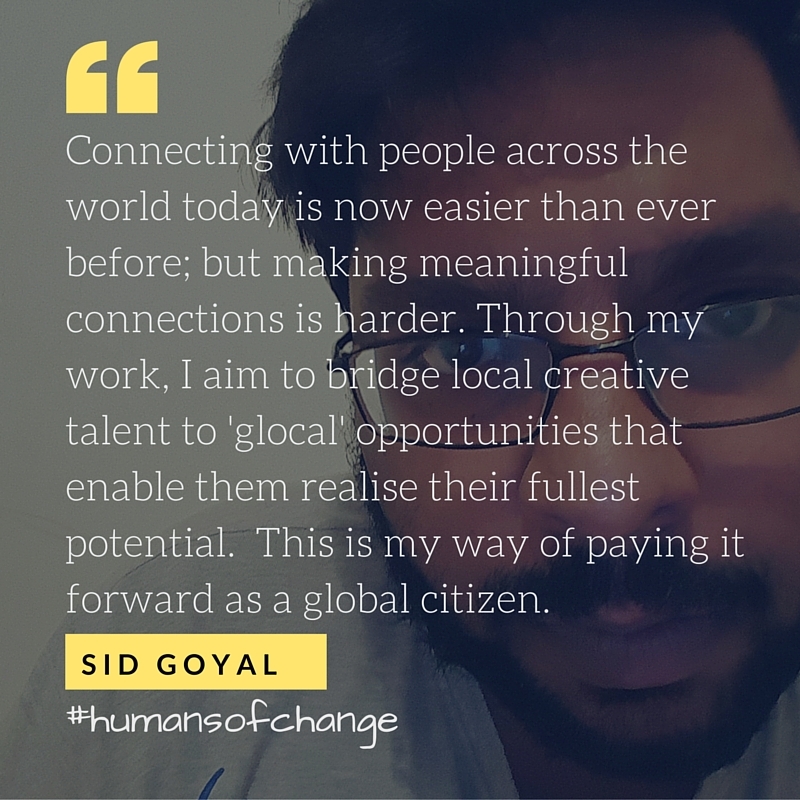 The best way I can pay it forward is by using the unique experiences that I've had to connect people on the local level to a global scale. I now find myself in India, with family, finally happy, and now I have to make and become the connection to bridge worlds through my work as a freelance editor and producer. My intention is to build a platform to fill the gap I see - helping people to realise their full potential, not just in the country you life in, but in the world we live in - thinking globally and acting locally. It's always nice to have other people experiences and values help to shape something that's bigger than all of us. If you find yourself in a similar position as me, reach out, let's do something!